Casa Grande Ruins National Monument - Super Inky! 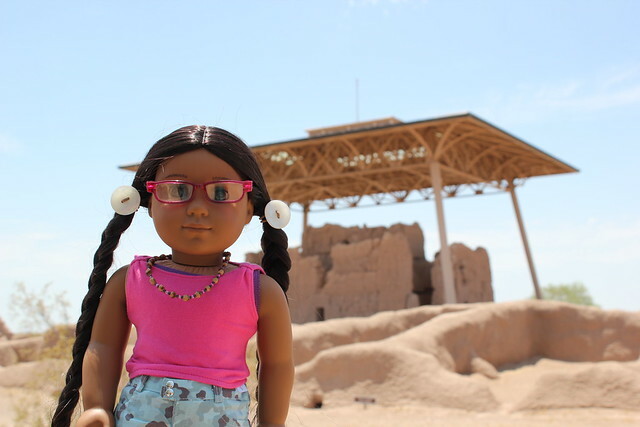 The day Raven and I went to Tuzigoot was supposed to be the last day of our big road trip. However, Raven's mom was tired and didn't think she could drive us safely all the way to the city where Raven lives. We ended up getting a hotel room and leaving for Raven's home the next morning. The extra time meant that we could visit another National Park site- Casa Grande Ruins! Casa Grande is a large, four-story building that was made by the Ancient Sonoran Desert People over 1,500 years ago. Can you see it behind Raven? It has survived until today, but it now has a shelter to protect it. You can't go inside it, but you can walk right up to it. There are lots of birds living in it, but no people. Many people through history have also carved their names into the wall. That is vandalism, so you can't do that any longer. 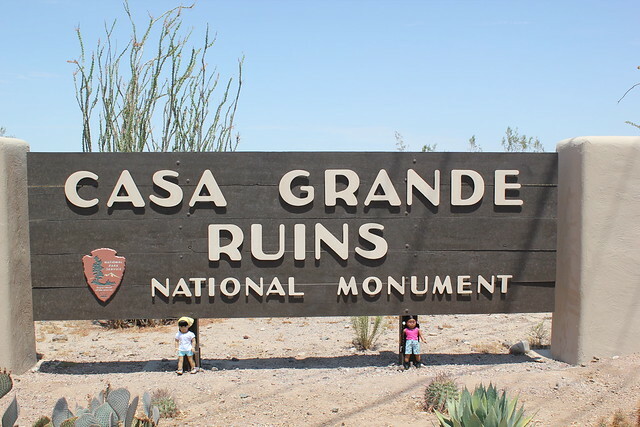 Of course, we did the Junior Ranger program at Casa Grande Ruins. Luckily, most of the work we had to do was in the museum portion of the park. It was really, really hot there! I thought it had been hot at Sunset Crater, but it was even hotter at Casa Grande Ruins. We were only outside for a little while before I turned pink. We had time to walk around the ruins and see some cacti before we went back in. Back in the museum, there are cool exhibits that teach about the Ancient Sonoran Desert People and the native peoples that live there today. There was also a table full of different things for kids to touch; I thought that was really cool. When we finished our booklets, we took them to the park ranger to have them checked. The ranger was really nice and asked us lots of questions about what we had seen and which other parks we had visited. 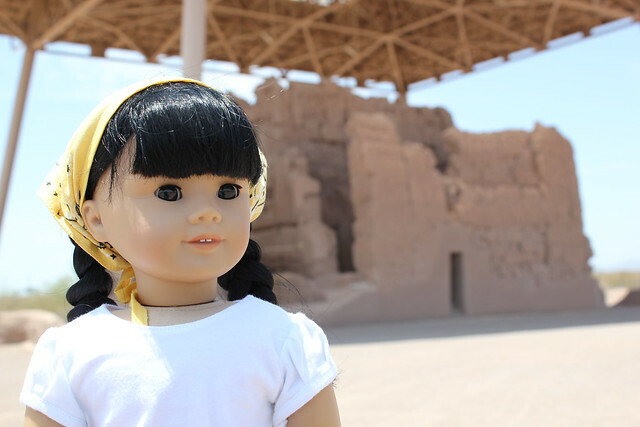 At Casa Grande Ruins, like some other parks, you only have to do part of the activities in the book. Still, Raven and I did the entire activity book! The ranger rewarded us for our hard work with an extra badge, sticker, and pin, in addition to the regular patch! We were really excited and glad we had done the extra work. After the ranger swore us in, we each picked out something from the gift shop. I got a keychain with little charms of a ranger hat, ranger badge, and park service logo! Casa Grande Ruins is a really fun little park. The rangers are very nice and their Junior Ranger program is really fun. If you have the chance, you should definitely visit! I'm glad we did the extra work and were rewarded! Have you ever gone above and beyond and earned something special? 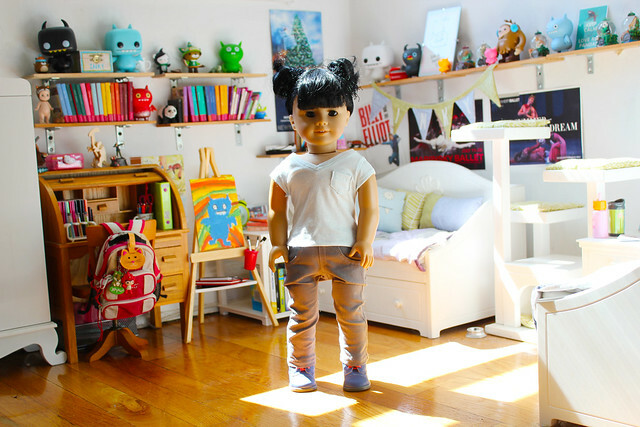 In this entry, Inky wears: a white tee from Liberty Jane Clothing, striped shorts from Royal Doll Boutique, and bandanna and hiking boots from American Girl. Casa Grande sounds like a place I'd love to visit! The only problem is, I live too far away. Being rewarded for going above and beyond? Hmm. About two years ago, at the place where I did gymnastics, I was asked to assist with classes. I was even recognized during the recital! I can't wait to hear more from you! Maybe if you travel someday, you will have the chance to visit Casa Grande! Are there any National Parks near where you live? How cool that are able to help with gymnastics! Here in Tennessee, there is only one national park I know of, The Great Smoky Mountains National Park. And then there's plenty of state parks. Like Shelby Farms, which is five times bigger than Central Park! well maybe for badge ^.^ how many patches/ pins do you have now inky? 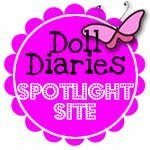 love to see all the JR places you've been! It was SUPER CRAZY hot! I'm not sure how many Junior Ranger awards I have now. I should probably count them, don't you think? 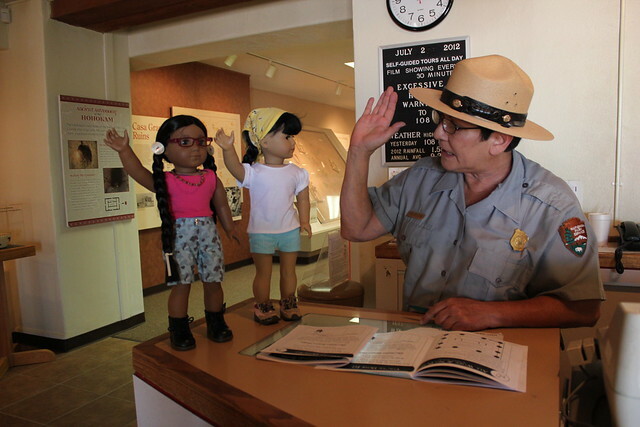 If you want to see all the Junior Ranger places I've been, just click on the "junior ranger" tag on the bottom of this entry. It should show you all the parks I've been to. Stella and I would love to visit Case Grande some day! It looks gorgeous! We're sure the girls have seen Case Grande because they have been around for thousands of years (they're immortal) and have been nomads with their little tribe. 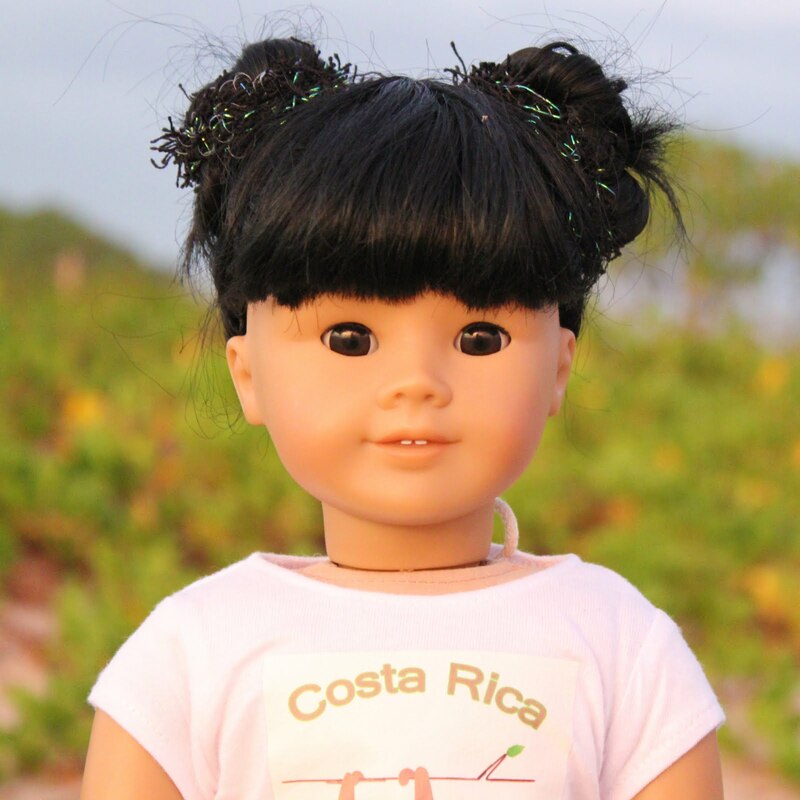 You can visit our new blog for more information on the girls! Wow, being immortal sounds really awesome. Think of all the Junior Ranger badges you could get, with all that time!